In his 11th season at Bradley, DeRose steered the Braves to the NCAA Elite Eight, with a postseason run that included come-from-behind victories over former national champions Indiana and Maryland. After the tragic death of Danny Dahlquist on the eve of the season, DeRose pulled his players together to win a share of their third consecutive Missouri Valley Conference regular-season title, their first MVC tourney crown and their first NCAA tourney win. Hersey Hawkins has participated in basketball at ever level with tremendous skill. The former Chicago prep star is Bradley's all-time scorer with 3,008 points, shooting .539 and averaging 24.1 points for his 125 college games. His 63 points at Detroit U. is a Bradley record. In his senior year, 1987-88, he was a consensus all-American, being named to seven dream teams while leading the nation in scoring with a 36.3 average. 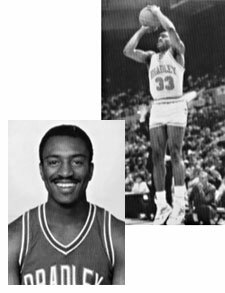 He was Missouri Valley Conference Player of the Year twice, made the all-conference teams his final three seasons, and was Bradley's MVP three times, tying in 1986 with current coach Jim Les. Philadelphia and played 13 years in the NBA. He started with five years with the 76ers, then two with Charlotte, four with Seattle, one with the Chicago Bulls and a final year with Charlotte in 2001-2002. For 13 seasons he scored 14,470 points, made 1,126 3-point field goals and averaged 14.7 points. In his first five seasons with Philadelphia he averaged 15.1, 18.5, 22.1, 19.0, and 20.3. During one stretch he played in 527 consecutive games. He appeared in 983 games, starting 896. Award. And it was Hersey Hawkins who scored the 7,000,000th point in NBA history!